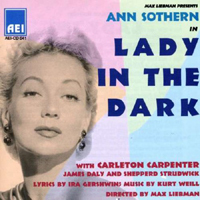 Television Production Soundtrack, 1954 (AEI) (1 / 5) Taken directly from the soundtrack of a kinescope of a Max Liebman television production, this Lady in the Dark stars Ann Sothern as Liza. The orchestrations are by Irwin Kostal, and they bear little resemblance to Weill’s originals; the musical style is more 1950s Hollywood than 1940s Broadway. 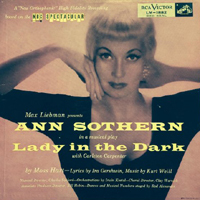 Sothern handles her dialogue well, and has the right glamour and archness for the role. Her “One Life to Live” is jaunty and cool, her “My Ship” is smooth if not overly complex, but her “Saga of Jenny” is incomplete and cleaned up for TV. The recording includes three long, extraneous dances to variations on Weill’s music; they were performed in the 90-minute TV special by Bambi Linn and Rod Alexander. These annoying entries aside, the bonus tracks on this CD make it worth purchasing. 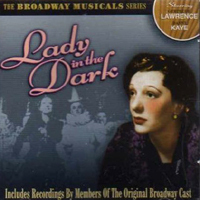 Among them are Lawrence’s studio recordings of several songs from the score, plus her live broadcast performances of “Jenny” and “My Ship” with MacDonald Carey of the original Broadway cast. — J.D. Studio Recording with TV Cast, 1954 (RCA/no CD) (2 / 5) Before Lady in the Dark was performed live on television in 1954, the cast went into a studio and made this album. Irwin Kostal’s orchestrations sound much better here, without all the background noise and hubbub of the AEI release reviewed above. Ann Sothern comes across well, while Carleton Carpenter does a fine job as Beekman in the “Glamour Dream” and does not disappoint with the Ringmaster’s “Tschaikowsky.” Robert Fortier gets to sing a little as Randy Culver, the character’s name having been inexplicably changed from Randy Curtis. — J.D. 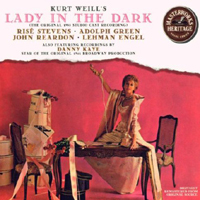 Studio Cast, 1963 (Columbia/Sony) (3 / 5) When originally released, this was the fullest recorded representation of the classic Kurt Weill-Ira Gershwin score for Lady in the Dark. While the notes claimed it was “musically intact .. complete with Kurt Weill’s original orchestrations,” there are many internal cuts that were probably made to fit the songs onto a single LP, and some of the orchestrations were fiddled with. Still, the recording gives listeners a sense of how the dream-sequence songs hung together to form mini-operettas — one of the things that made the show such a groundbreaker. The orchestra and chorus are jauntily conducted by Lehman Engel. As Liza, Rise Stevens brings requisite glamour to “One Life to Live,” some beautiful tones to “My Ship,” and does her darnedest to shed her operatic mannerisms in “The Saga of Jenny”(but ends the song with a glorious high note). If she is not fully convincing in the more dramatic moments of dialogue and recitative, this is still a hearty and well-sung performance. Adolph Green works too hard at times, but he’s nevertheless enjoyable and makes the most of “Tschaikowsky.” John Reardon is heard as film star Randy Curtis, the role originated by a barely musical Victor Mature; he sings the big ballad that Mature never sang, “This Is New,” with ringing baritenor tones. The smaller roles are also well handled. — J.D. 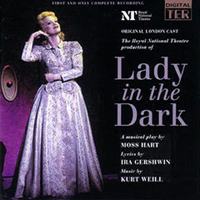 Original London Cast, 1997 (JAY) (4 / 5) All things considered, this is the finest recording of Lady in the Dark. The original Weill orchestrations were used with some augmentation, and there are no cuts in the score. As a result, the recording is nothing less than revelatory. In the pivotal role of Liza Elliot, we have Maria Friedman, a brilliant star of the London musical theater. She is a much stronger singer than Gertrude Lawrence, possessing an exciting belt voice with a soprano extension. Her “One Life to Live” is very belt-y, but that sound of confidence, shaken at the end of the “Glamour Dream,” creates its own mystique. When she offers lighter soprano tones in “My Ship,” Friedman’s Liza sounds as if she is truly rediscovering the words and realizing for the first time what they mean to her. She does an equally great job with “The Saga of Jenny.” Another lovely discovery is that we can finally hear “This Is New” as originally conceived; singing it with Friedman, the American baritenor Steven Edward Moore sounds wonderful. James Dreyfuss won an Olivier Award for his performance as Russell Paxton/The Ringmaster, and he comes across fairly well on the recording, which also boasts excellent choral work. — J.D.